One of my craziest culinary experiences here in Dubai, if not THE one, was just after we moved here, almost 6 years ago. I guess most people know the Burj Al Arab, the sailboat shaped 7 star hotel. We once went to a hotel nearby which offered a panoramic view on the Burj Al Arab which is illuminated at night, to have a light dinner. Found a table outside, enjoyed the view on the hotel and the sea and ordered some salads. I ordered a Three Tomato Salad as I was suspecting something fancy made of three different sort of tomatoes. The price of that salad also made me suspect something extraordinary. You want to know what was on my plate when it arrived? Three cherry tomatoes cut into halves on two or three lettuce leaves. Not only tomatoes, no, cherry tomatoes. The smallest ones you can find. Well, lesson was learned, as we obviously just paid for the view and not for quality food. However, this salad contains tons of beans, three different sorts, colors and shapes: tiny mung beans, soy beans and green beans. And some broccoli. It's spiced up with a hearty dressing made of fresh ginger and soy sauce. And for the tough ones, you can even sprinkle fresh red chillis over the salad. This salad is well on the way of becoming my favorite, as the mung and soy beans can be made in bigger amounts and kept in the fridge for a couple of days. The green beans and the broccoli are steamed tender in no more than 5 minutes. And that's it. This salad tastes great cold. It is a great starter and can as well be a great lunch. Bon appetit! Soak the soy beans for 2-3 hours. Cook in plenty of lightly salted water until tender, but still slightly crispy, about 20 minutes. Drain. Set aside and let cool. 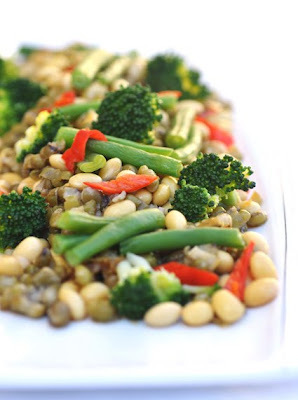 Cook the mung beans in slightly salted water until tender but not mushy, about 15 minutes. Drain and set aside and let cool. Steam or cook the broccoli and the green beans for about 5 minutes. Transfer them to ice cold water, so the cooking process is stopped and they keep their vibrant color. Drain. Combine all vegetables in a serving bowl. Pour the dressing over the vegetables and stir. Sprinkle red chilli over the salad. The salad is best be eaten cold.